On the left (literally for the audience, and figuratively in every other way) was the champion for the evolutionary side. Bill Nye, "the Science Guy," made fundamentalist Christian heads snap recently when he declared it was flat-out wrong for children to be taught creationism. I met him in a room behind the stage as the audience milled around, waiting for the event to begin. Having just spoken to an adoring crowd of science fans at a university the night before, he feared he was in hostile territory. "I think my agent is the only one on my side," he said, only half-joking. "I think the other 899 people in here don't really see it my way." It was hard to tell. Aside from the woman with the T-shirt, there were others wearing pro-Nye gear, but no good way to count them. Still, it looked like his supporters were probably in the minority, and I mentioned to him that some scientists were grousing online he was validating the creationist argument by even showing up. "So why are you here?" I asked. "I'm here for the U.S. economy," he said. "See, what keeps the United States in the game for the world economy is our ability to innovate, to have new ideas, and those inventions come from science." "And you see creationism as sort of poisoning the well for science?" "Yes. I mean, I'm all for (creationism) in philosophy class, history of religion class, human psychology class," but bring it into science class, and Nye gets upset. And that is what disturbs Nye's debate opponent. Ken Ham is a rock star in the creationist community who is quick to point out his own educational credentials and those of other scientists who support creationist views. He is one of the founders of the Creation Museum, where dinosaurs are depicted as living alongside humans and the Great Flood of Noah is an indisputable fact. I first met Ham back when the museum was being built, and he greeted me Tuesday night in his affable, Australian manner just outside the room where Nye was waiting. "I must admit I'm a little nervous," Ham told me looking out at the audience. "I want to passionately present my case and defend what I believe, but we never imagined it would become this big. It's amazing. Just shocked all of us." It was impressive to see how much interest the event generated. A riser with a phalanx of production cameras sat in the middle of the room, 70 or so journalists were clustered to one side of the stage, and security officers seemed to be all over the place. I was told that metal detectors were being used to screen the audience, and I saw what I presume were explosive-sniffing dogs quietly working the hallways. Both sides in this debate know the subject matter can spur extreme feelings, and they did all they could to make sure extreme actions didn't follow. Just the same, one organizer pointed out a corner some 30 feet behind my spot on the stage. A door there opens to the parking lot, he said, "just in case, for any reason, you need to get out fast." The advice was appreciated but unnecessary. The crowd proved to be polite, attentive and admirably restrained through the entire 2½-hour debate. So were the debaters. 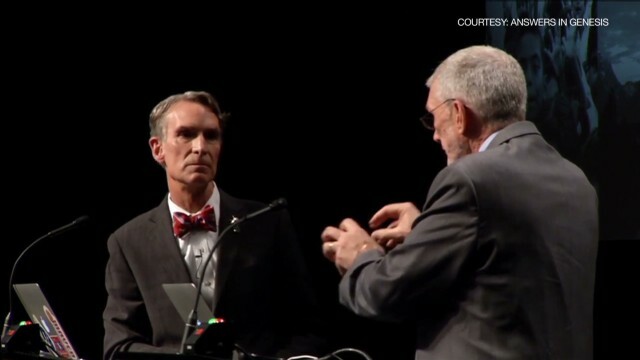 Although they were firmly on opposite sides of the fence, Ham and Nye presented their arguments calmly and respectfully. Neither tried to shout the other down. I spent my time listening to what they had to say, watching the clock to make sure they got equal time and trying to ensure people in each camp felt their man was treated fairly. Both debaters shook hands at the end to rousing applause. It was not a fight after all. Considering the depth of feelings people have about this issue, I asked both men before we began if they expected to change anyone's opinion. Ham said, "I will present (my information) trying to change people's minds, but knowing as a Christian it is God who changes people's minds, not me." Nye said, "Here is my hope: I will remind Kentucky voters that this is a serious issue and that it is inappropriate to include creationism as an alternative to ... the body of knowledge and the process called science." By the time the debate was done, a fierce winter storm had settled in. I waded through the Creation Museum parking lot ankle deep in snow, with sleet pelting down. And I think it was a worthwhile evening - a debate humankind was created to have, or to which we evolved. I cant demonstrate it by the way you want it demonstrated. i read the sermon on the mount and i see nothing wrong with what was said. I am asking you to objectively demonstrate your claims. Please don't insinuate I am asking for an unreasonable "special" demonstration. I cant demonstrate it objectively as i said before. There is a reasonable doubt not to believe. Same with the OJ or Casey Anthony trials. The basis of my belief is the bible. That basis is supported by my observations of human behavior and experiences in life. It is inadmissible in our courts because it is subjective. Our division have been with us from the beginning of time. The teachings of God is to unite. Separate the sins of humams from the message. Jesus Christ came to this world to redeem it. The "Dispensation of Grace" reigned ever since. "39 and through Him everyone who believes is freed from all things, from which you could not be freed through the Law of Moses."